trick or treat | Badudets Everything Nice! One of the most exciting things to happen during BER months aside from Christmas is Halloween! And unlike before when Halloween is only celebrated in the US, now we also have lots of Halloween parties in malls and even subdivisions. Kids and adults would dress up in their Halloween costumes and they’re ready for trick or treat. Each year, Halloween events organizers are getting more and more creative with their Halloween parties. Aside from making sure that there are lots of treats for the kids, they will also adorn the venue with scary ornaments. To encourage the people to wear costumes, organizers also choose the Best in Costume to receive a reward may it be in a form of cash or more treats. Because of this, plenty of people are now becoming creative with their costumes. Toy Kingdom and Toys R Us also offer lots of Halloween costumes as early as September. To some, they would think of DIY Halloween costumes to make sure that they have the most unique costume. Last year, it’s the first time that we joined a trick or treat. Gwen was 11 months then, I just borrowed her cousin’s costume. This year, I’m still thinking if I should buy or just DIY. I just want her costume to be unique and not scary! Halloween costumes need not be scary after all. For sports fanatics parents, there are lots of basketball jerseys available for kids. It’s not that unique but cute, and sporty! Anyway, if you’re an NBA fan, it will be fun to dress up your baby as an NBA Baby. 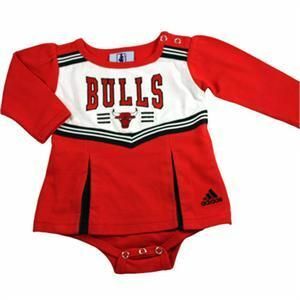 Chicago Bulls fans, you can dress your little girl as a Bulls cheerleader.